*This Instagram statistics article has been updated, and is updated regularly with new Instagram statistics, as new studies are made, and existing statistics are updated or removed in the pace that they become relevant. This ensures that you can always expect fresh and up-to-date Instagram statistics in this article. Have you come here to see the impressive Instagram statistics? Wondering about the Instagram statistics of its users or the Instagram statistics for marketers? Instagram has grown dramatically over the years, and it is driving the world crazy, making marketers confused on where to put their efforts, while at the same time providing tremendous marketing results for those who know how to use it properly. Luckily, we have the Instagram statistics that prove it. In the pace technology and social media is evolving, it is difficult to notice big changes because we are in the middle of them. But when you look two years back in time, it is a completely different reality. In just a few years, Instagram has gone from being the hunter to being hunted by other platforms it has surpassed. This shows the incredible popularity of Instagram and the power it has. In this article, we’re digging deeper into Instagram statistics in order to fully understand the true marketing power and potential Instagram carries. 80% of Instagram users are based outside of the US. Instagram is widely popular in Europe as well as in Asia. If you want to reach people outside of the US, Instagram can help you do that. At the same time, if you want to reach people within the US. Instagram can help you do that as well. 50% of 700 million users is quite a number. Among users in the U.S, women are the majority. But nevertheless, even if those percentages aren’t sky-high, they still resemble a whole lot of people. Posts that include a location that receives 79% more engagement. When thinking about how you can increase your engagement, most people think about hashtags. And while Instagram hashtags are great and tremendously effective, something that’s often neglected is the location hashtag. It is a simple touch that can do your engagement. Most of Instagram’s users are within the age group 18-29 years. Instagram is a social media platform that is widely used by the younger generation, however, that does not mean that people older than that can’t be found on the platform. The most used filter on Instagram is Clarendon. Clarendon is an all-around filter, and that’s maybe the reason why it is the most popular filter on Instagram. Instagram has 40 filters, so it can obviously be a little tricky settling for just one when choosing between the filters. But as the Instagram Statistic prove, most people seem to settle with the filter Clarendon. In just a few years, Instagram has gone from being the new kid on the block to one that is crushing a lot of its competitors. The number of Instagram users is steadily growing, while platforms like Snapchat are struggling. Only Facebook and YouTube have more log-ins per month than Instagram, and those are platforms that have existed for a considerably longer time. Instagram has over 500 million daily active users. While not all of Instagram’s users log in daily, a large part of them do, manning you can basically connect with anyone anytime. 32 percent of internet users in the U.S log in to Instagram daily. Instagram users “like” more than 4.2 billion posts a day. Instagram users are highly active, and when you see how many posts are liked on Instagram per day, you can also understand that its users are quite engaged on the platform. Humans relate to humans, and so it’s not strange that this is the case. It is, however, a great trick to know if you want to increase your engagement. 70% of content on Instagram isn’t seen. Instagram reported that 70% of the content on Instagram isn’t seen, and this is the reason why they decided to introduce the algorithm. Previously, users missed a lot of content in their feed due to the immense amount of content being shared every day, and with the algorithm, the idea is that you are only going to miss the type of content that you wouldn’t find relevant anyways. The algorithm, therefore, uses a number of different ranking factors in order to decide what content they are going to present in your feed, in which order, and what content you’re not going to see. 90% of Instagram users are not older than 35. Instagram is the lounge of the younger generation. Target people under 35 and you’ll find tremendous success. Among Instagram users in the U.S, 59% are under 30. Instagram is clearly a social media platform which caters to the younger audience, however, that is not to say that things won’t change in the future, because the Instagram statistics through time has seen that the age of Instagram’s users is slowly increasing, most likely as a result of more older people embracing social media. The amount of time users spend watching video on Instagram has increased more than 80 percent year-over-year. Humans are visual creatures, and this is an important reason why Instagram has become so immensely popular in the first place. But they say a picture says more than a thousand words, so you can expect videos to be even more impactful. Video hasn’t always been available on the platform, though. The number of videos produced every day has quadrupled. Instagram statistics are pointing in the direction that Instagram is going more video, and so is a number of other platforms. And with the increased demand comes an increased supply. 6 in 10 adults online have Instagram accounts. What was first considered to be a platform for kids have now proven people wrong. With 6 in 10 adults having Instagram accounts, it proves that Instagram is not only a place for teens. 32% of teens think that Instagram is the most important social platform. That’s over one-third of teens that think Instagram is the most important platform. If teens are within your target audience, you can with almost 100% certainty be sure that you’ll have success in targeting them on Instagram. Instagram currently has over 400 million daily active users. That’s more than most social platforms! Instagram has 250 million daily active Stories users. 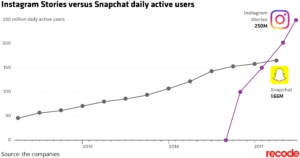 Surpassing Snapchat, Instagram’s Stories has grown tremendously since its launch. Succeed in creating amazing and appealing Instagram Stories and you’ll gain great traffic from it. 20% of internet users are using Instagram. People are moving from traditional internet mediums and find their way to social platforms. In 2016, there were 78 million people in the US. that used Instagram monthly. A staggering number that proves how widespread the use of Instagram is. There are 16,600,000 Google searches for the term “Instagram” per month. Try saying that number. It’s huge! The interest in Instagram is immense. Fail to implement Instagram marketing in your strategy and you’ll have a hard time gaining traction once the platform starts becoming saturated. The Instagram app has over 1 billion downloads on the Play Store. 51% of Instagram users access the platform daily. Imagine being able to reach and impact your customers every single day. Well, you can! According to Instagram, the launch of Instagram Stories has greatly contributed to increasing the time spent on the platform. Moreover, Instagram also reported that users who are more than 25 years old spend more than 24 minutes a day. 35% of people say they access the platform several times per day. 86% of Instagram users access the platform daily or several times per day. Instagram has become an important role and a necessity in people’s lives. 91.07% of Instagram posts are photos. Instagram is a visually driven platform so inevitably, photos will play an important role. There are 95 million photos and videos being shared on Instagram every day. That’s a lot of photos and videos! To stand out, you need to create amazing content that is both appealing, unique, and high-quality. Instagram users share an average of 80 million photos per day. Around 15 million videos are uploaded on Instagram and 80 million photos are uploaded per day. Create a content strategy that circulates around both video and photo. Since Instagram started, over 40 billion photos and videos have been shared on the platform. It would take 31 years, 251 days, 6 hours, 50 minutes, 46 seconds to count to one billion. 40 times the time for 40 billion. That gives you an idea of how large the number is. It is more important than ever that you stay unique in order to cut through the noise. Instagram launched on October 6, 2010. In just 2017, Instagram has grown from nothing to being a big player in the world of social media. This just proves how quickly evolving the world is, and that new social platforms can appear at any time and dominate the industry within a few years. There are over 2,000 comments being made on Instagram every second. Comments are an important part of customer engagement. Make sure you respond to every single one you receive and also comment on other people in your industry. Users on Instagram like 3.5 billion photos every day. This is one of the most interesting Instagram statistics because while the demand and interest in video have skyrocketed on Instagram, which you saw in an earlier statistic, the engagement for videos seems to be lower than on photos. A reason for that might be that people don’t watch the whole video, something that is needed to understand the context, and then they just carry on scrolling. Nearly 50% of captions and comments on Instagram contain at least one emoji. Emojis are a great way to express yourself and get your text to stand out. If your brand image allows you, implement emojis in your social media strategy but don’t go overboard. Around 6% of the world population is estimated to use Instagram. 100 years ago, reaching 6% of the world’s population was considered impossible. Well, not you can. Gives you a perspective of how huge Instagram really is. The Instagram app has over 8 billion downloads on the App Store. This number is climbing for every day. There are 25 million registered business profiles using Instagram. Does your business have a business account? More brands than ever implement Instagram into their marketing strategy and that’s because it works! Fail to implement it and you risk being surpassed by your competitors. Instagram has more than 1 million monthly advertisers. An increase of 800,000 from the same time the previous year. Instagram ads are set up through Facebook’s ad manager since Facebook now owns Instagram. If you’re familiar with Facebook ads, you’ll be able to set them up in a heartbeat. Instagram ads also have a ton of different target criteria you can use to laser target your ads towards those who really matter. In 2017, over 120 million people on Instagram clicked a call to action on an Instagram ad to learn more about the business. This is proof that Instagram ads work. People get impacted by them and click through. 60% of Instagram users say that they have learned about a product or service on the platform. Educating your audience about your brand’s existence is the first step to driving a sale, and that’s exactly what Instagram helps you do. Gain more exposure and more brand awareness. In 2017, 70.7% of U.S. companies will use Instagram for marketing purposes. 70% of companies is a huge number! Brands wouldn’t use Instagram if it wasn’t beneficial! If you aren’t using it, there’s clearly something you’re missing out on. Instagram generated an ad revenue of $1.53 billion in 2016. This is a 144 percent increase from previous year. Instagram’s ad revenue is climbing for every year. Again, if brands wouldn’t see a positive return on investment, they wouldn’t abandon ineffective and traditional ads such as display ads for Instagram ads. 53% of Instagram users follow at least one business. There’s clearly a great interest in brands on social media, so make sure you are there to meet your audience. 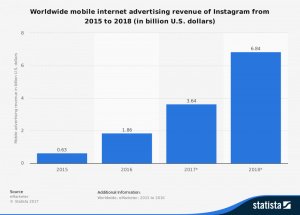 Instagram’s mobile ad revenue is expected to reach $2.81 billion in 2017. From $1.53 billion to $2.81 billion in just one year. The numbers are staggering! Top brands on Instagram have an average engagement rate of 4.21%. This is 58 times higher than on Facebook and 120 times higher than on Twitter. For organic reach, Instagram is one of the most effective platforms. Use Instagram correctly and you’ll be able to generate amazing results all with the help of organic reach. In December 2017, there were 171,000 Instagram ads. What’s so interesting about this is that in July the same year, there were 134,000 Instagram ads. This is an impressive 28% growth in just six months. This tells us that the interest in Instagram ads from businesses is high, and is continuing to increase. Of ads run on Instagram, 25% are single videos. You know what they say: a picture is worth more than a thousand words, and if that is the case, a video is worth a lot more. With videos, you can better mediate your message and impact people on a deeper level, and the fact that the interest in video content on Instagram is increasing doesn’t exactly harm, either. Create a branded hashtag and encourage your audience to use it. They work! 70.7% of businesses in the US. are using Instagram for marketing in 2017. User-generated content leads to a 4.5% higher conversion rate for brands on Instagram. Get your followers to share images and create content with your products. Another way is to partner with leaders in your industry, also known as influencers to create and share content around your products. People engage with brands, but what if you don’t engage back? Social media is called social media for a reason. You’re supposed to be social! Respond to every message you receive and thank everyone who comments on your posts. Engaged Instagram users have an order value of $65 as opposed to Facebook $55. Engage with your audience on a regular basis and you’ll be able to build trust which will ultimately lead to sales. Users on Instagram are 2.5X more likely to click on an ad than on other social platforms. Maybe it is because the ads displayed are more relevant, or maybe it is because Instagram has been able to implement ads in a seamless way that makes them more natural. Either way, Instagram ads are effective and clearly have a great interest in them. Since Instagram released Stories, it has exploded in popularity, and the usage of Stories is only increasing. An important reason for the popularity of Stories is that it allows people, including brands to share raw, unedited, behind the scenes content, without worrying that it will clutter their feed as they will disappear after 24 hours. A survey from 2015 found that 75 percent of Instagram users have taken action into buying something after being inspired by a post. If you can share amazing posts and build a strong Instagram presence, you can with almost 100% certainty says that you’re generating sales as a result of it. 65 percent of the top-performing posts on Instagram feature products. This is great news for marketers and brands who want to use Instagram for promotion. While you shouldn’t post promotional post after promotional post, there is nothing wrong with sharing photos of your products on Instagram every now and then, because your followers actually enjoy it. But if you start shoving ads in your followers’ face, they’ll leave you without hesitation. Just make sure you implement your products in a seamless way that makes the presentation more natural. Among the top brands on Instagram, 60 percent use a consistent filter. This is an important part of an Instagram branding strategy, which allows you to remain consistent and recognizable at all times. Having a consistent filter allows you to reinforce your identity and personality, and stand out from the crowd. Marketers are all after one thing in marketing: attention. Marketers trade on attention, and this is also the reason why they need to be where their target audience is. And based on the number of people who are using social media, more and more brands are starting to realize the importance of being active on social media. As a result, the interest in brands has increased dramatically increased, because instead of brands shoving ads down their audience’s throats, they can be a part of the conversations. Instagram’s ad revenue is expected to reach nearly $7 billion in 2018. This is according to Statista. What’s interesting about this is that when Facebook bought Instagram for $1 billion dollars, Instagram wasn’t making any money. And when Facebook paid a whopping $1B, people dropped their jaw because they thought they made a huge mistake due to the fact that Instagram didn’t make any money. But Facebook realized the one thing that marketers trade on which Instagram had, and that is attention. When you have people’s attention, you can do a lot, and now, Facebook has gotten quite a good return on investment. 60 percent of users on Instagram find new products on the platform. Instagram is a great platform for increasing the brand-awareness around your brand and introduce people to your products. What’s so good about Instagram is that you can showcase your brand and its products in a fun and engaging way, to get people excited about them. 96 percent of U.S. fashion brands use Instagram. If you are in the fashion industry, it’s almost impossible not to implement social media and Instagram particularly. It’s about eating or getting eaten. Users on Instagram are 70 percent more likely to make online purchases. Instagram users are internet shoppers, so if you have an online shop, you’d be missing out on some incredible opportunities if you didn’t leverage Instagram. The top brands post an average of 4.9 times a week on Instagram. A question that is often being asked by brands on Instagram is “how often should I post?”. And the real answer is that it depends on your target audience, but the top brands on Instagram are obviously doing something right, so why not use that number as a starting point and then experiment your way to the ultimate number of posts. 70% of performance campaigns generated statistically significant lifts for online conversions or mobile app installs. Instagram ads are effective both in terms of generating tremendous ROI but also in terms of being able to generate amazing results even if you’re on a small budget. There’s no doubt that Instagram can do amazing things for your brand. Where people’s attention is, that’s where you should be. And Instagram allows you to! And the best part is that Instagram has no lack of attention. In order to achieve the results shown in the Instagram statistics, you need to have a strong Instagram strategy and a team that knows what they are doing. Without the right resources, you’ll get surpassed by your competitors who know the true value of Instagram, in no-time. When talking about the business and marketing Instagram statistics, you cannot expect to just share a few posts, kick your feet up and see yourself achieving the same results as the Instagram statistics proved. Because in order to generate those results, consistency and great planning are demanded.